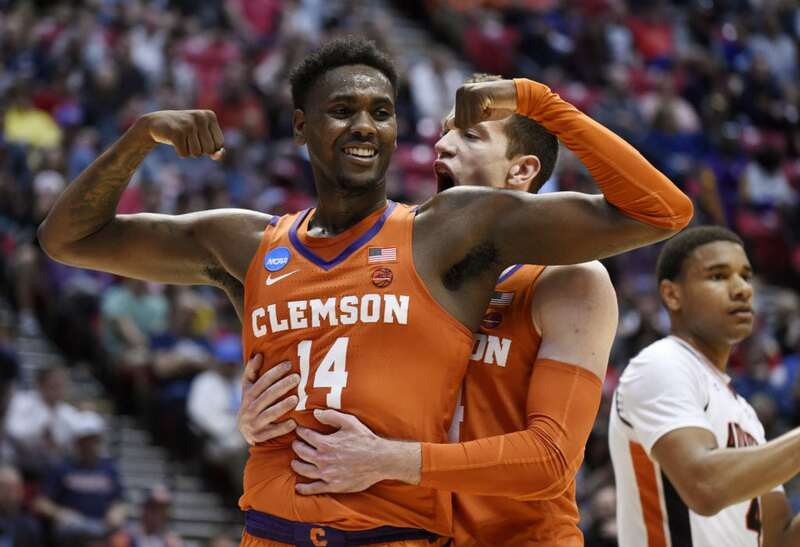 Clemson forward Elijah Thomas, front, celebrates a basket with forward David Skara during the first half of a second-round NCAA men's college basketball tournament game against Auburn on Sunday, March 18, 2018, in San Diego. It’s Kansas vs. Clemson on Friday night in Omaha, Neb., with a trip to the Elite Eight on the line. 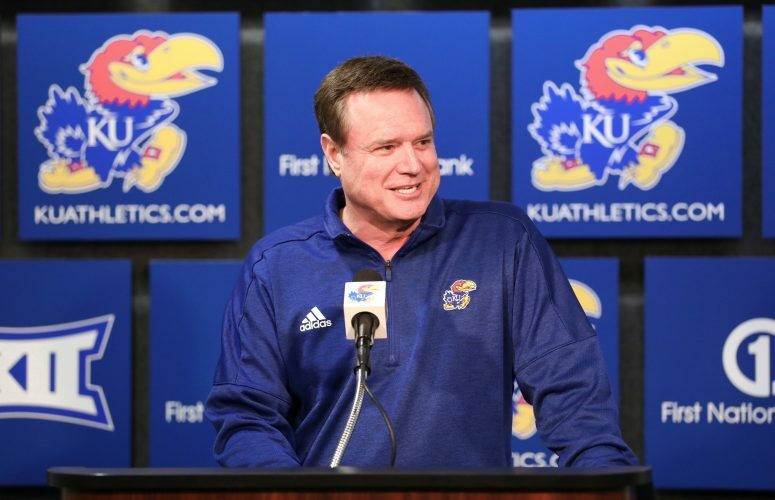 The top-seeded Jayhawks (29-7) will be playing for a third consecutive trip to the Elite Eight and the eighth in head coach Bill Self’s 15 seasons at Kansas. The fifth-seeded Tigers (25-9), who thrashed No. 4 seed Auburn 84-53 on Sunday night in San Diego, will be playing for a spot in just their second Elite Eight in school history. Their only other trip came in 1980 and the Tigers are playing in just their 12th NCAA Tournament ever and first since 2011. 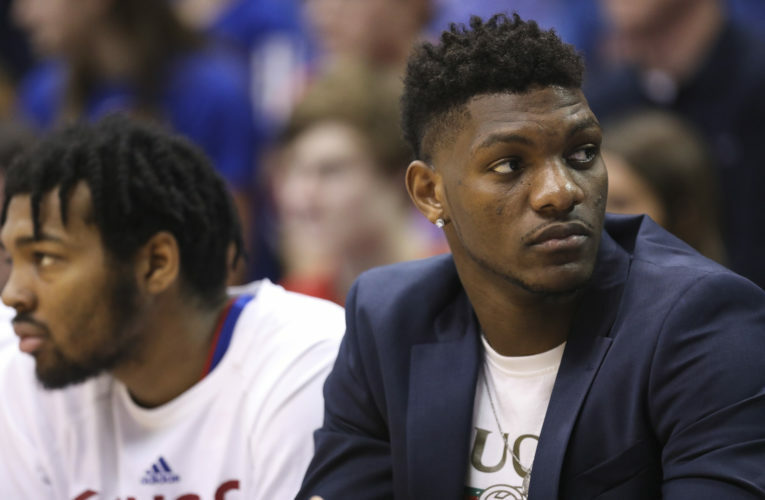 The Jayhawks and Tigers will tip off at 6:07 p.m. on CBS on Friday and Clemson figures to have KU’s full attention from now until then. The Jayhawks will be crashing an all-ACC regional in Omaha this weekend, with No. 2 seed Duke and No. 11 seed Syracuse playing in Friday’s other matchup. The two winners will play on Sunday for the right to go to the Final Four in San Antonio. As was the case in Wichita this weekend, the Jayhawks figure to have a significant edge in fans in the stands. 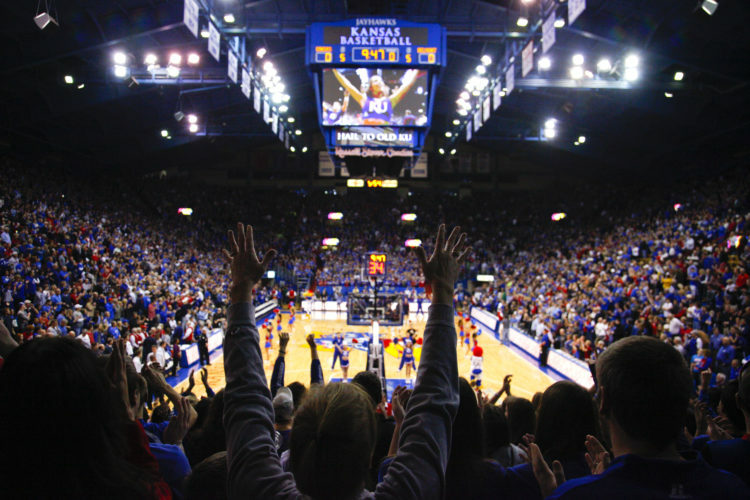 KU’s campus is just 210 miles south of Omaha’s CenturyLink Center. Clemson (1,098 miles from Littlejohn Coliseum to CenturyLink), Duke (1,236 from Cameron Indoor Stadium) and Syracuse (1,134 from the Carrier Dome) all must travel from several states away to get to the site of this year’s Midwest Regional semifinals and final. The Tigers finished the season ranked No. 20 in the final Associated Press poll and currently rank No. 14 in the KenPom.com rankings. The Tigers are ranked 42nd in KenPom’s adjusted offensive efficiency ratings and 7th in adjusted defensive efficiency. Kansas, meanwhile, currently sits 9th in the KenPom rankings, 5th in offensive efficiency and 43rd in defensive efficiency. 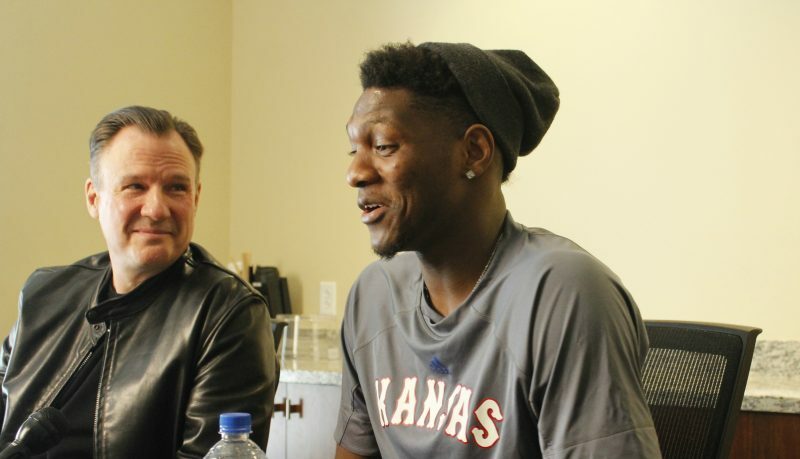 While the experience edge clearly will favor the Jayhawks in Friday’s matchup — Kansas seniors Devonte’ Graham and Svi Mykhailiuk have played in more NCAA Tournament games than Clemson’s entire program has, 24-22 — KU coach Bill Self made sure to point out after Saturday’s 83-79 victory over Seton Hall in Wichita that there was only one thing that truly mattered this time of year. The Tigers enter the matchup winners of just five or their last 10 games. But Sunday’s victory over Auburn was arguably Clemson’s best game of the season and all five of those losses during that stretch came against NCAA Tournament teams. After being picked to finish 13th in its conference during the preseason, Clemson finished third in the always-tough ACC, at 11-7. 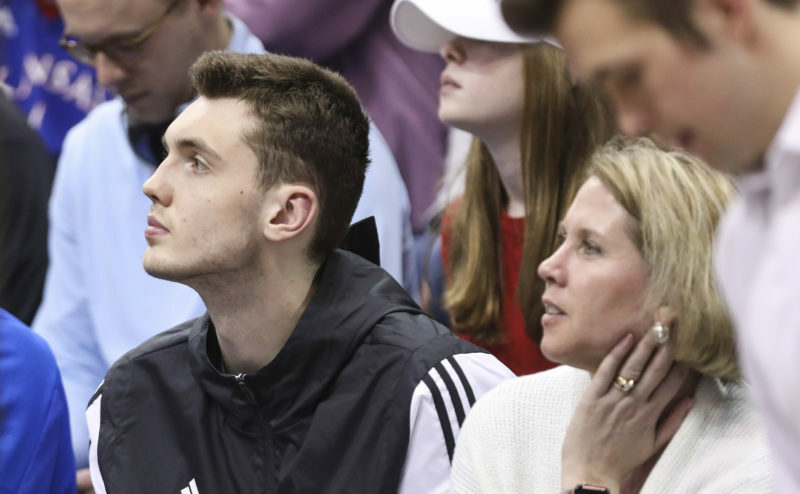 Eight of its nine losses came to NCAA Tournament teams, including two to top overall seed Virginia and one each to second-seeded Duke and North Carolina. The Tigers, coached by Brad Brownell since 2010, also beat UNC and Miami, when both were ranked in the Top 20. The lone loss to a non-tournament team came in November, when Temple topped the Tigers in the Charleston Classic championship game. Clemson’s guard-heavy attack features five players who average in double figures, led by 6-foot-3 junior Marcquise Reed (15.9 ppg, 4.7 rpg and 3.4 apg) and 6-3 senior Gabe DeVoe (13.5). Inside, junior forward Elijah Thomas (10.6 ppg, 8.0 rpg) led the Tigers’ front line. Clemson shot 45.6 percent from the floor and 36.8 percent from 3-point range this season. 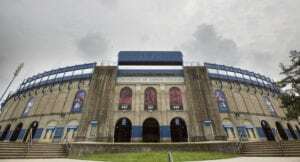 Self said the Jayhawks will meet Monday and go through a light workout before practicing hard on Tuesday and again Wednesday before taking a bus up to Omaha on Wednesday afternoon. From there, they’ll settle into their new surroundings and get ready to get after it. “We’ll practice Thursday in Omaha and be ready to play Friday,” Self said. Which current Kansas basketball player are you?